Steam injection is the most common type of thermal EOR. Most of the viscous, shallow heavy oil in North America is produced by steam injection. Oil production from thermal EOR with steam has been as high as 450,000 bpd in the United States but has declined in recent years. This oil production is primarily from shallow fields in California. However, steam injection in the shallow tar sands in Canada have been increasing and now exceeds 1.5 million barrels per day. The worldwide production of oil with steam injection is over 2.0 million barrels. High water saturation is another heat sink mechanism. In addition, low permeability of the reservoir slows drainage of oil. There are three types of steam processes; soaks, drives and SAGD (steam assisted gravity drainage). Soak means to periodically heat the reservoir with steam and then let oil drain to the same wells. In a drive pattern of injectors and producers are used. As generally practiced, steam overrides the oil in the formation and the heated oil drains to the producers. The following figure illustrates gravity drainage and the steam chest at the top of the formation. The figure above shows the steam chest and heated oil zones in a steam drive. Steam is injected as a mixture of vapor and liquid. The weight fraction of the vapor is called steam quality. The vapor has more energy than liquid water, so higher quality is good. As the vapor condenses around 350,000 BTUs/barrel of vapor are transferred to the reservoir (2.3 BJoules/ton) fluids and rock. This energy heats the cap rock, reservoir rock, base rock and reservoir water. If the reservoir is too thin, too wet or its porosity is low too much energy is lost and steam injection is not practical. When conditions are right, a steam chest forms at the top of the reservoir because hot vapor has a low density. The oil saturation decreases to approximately five percent there as oil drains downward. The hot, low-viscosity oil and condensed water continue to drain downward either to the producer or to heat the oil below. At the bottom of the reservoir hot water is displacing oil. Since water is more viscous and has lower energy than vapor, it moves through the reservoir slower than steam and produces oil less effectively. In generally, gravity affects fluids at the top of the reservoir more than at the bottom (unless reservoir dips significantly). The steam chest is also very important in a SAGD project. 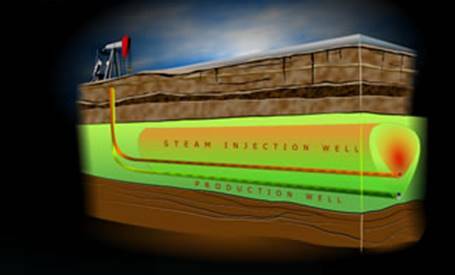 As illustrated in the figure below, the steam is injected at a horizontal well which is approximately 10 meters (33 feet) above a horizontal producer. As in the schematic of a steam drive shown above, the steam rises, and oil drains down the sides of the steam chest to the producer. In this type of project, oil is not pushed to the producer (unless there is a drive well nearby) and gravity drainage is the primary production mechanism. Steam is also used in steam soaks, where steam is injected at a well for a few days of weeks. After a few days of soak time for the steam to penetrate the formation, the well is used as a producer. Then the lower viscosity oil drains back to the production/injection well for a few months before the process is repeated. Steam injection is all about energy transfer. We must first recognize that the vapor is always in equilibrium with liquid water, so the temperature of the reservoir is controlled by the reservoir pressure. This is illustrated in the plot of the vapor-liquid equilibrium for water shown below. 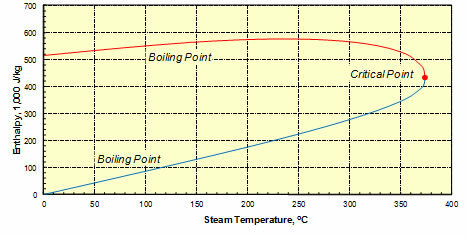 The figure below shows that injecting steam at low pressure (1,000 kPa ~ 140 psia) cannot heat a reservoir above 200°C because condensation of water controls the temperature. The temperature of a deep reservoir can reach 300°C if the pressure is 8,000 kPa (1,160 psia). That is probably the upper limit of temperature because it corresponds to depths where too much heat is lost in the injection well. The final figure shows the energy of steam and water. 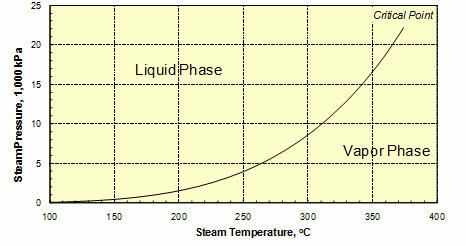 The figure illustrates first that the enthalpy of the vapor steadily decreases with increasing pressure and temperature until it vanishes at the critical point of water. The enthalpy of the steam is highest in a vacuum. At 1 atmosphere (100°C), 85 percent of the energy is in the vapor phase. At ten atmospheres (180°C) 78 percent of the energy is in the vapor phase and at 100 atmospheres (315°C) 65 percent of the energy is in the vapor phase. Above 250°C (3,900 kPa or 566 psia) the total enthalpy of steam decreases. 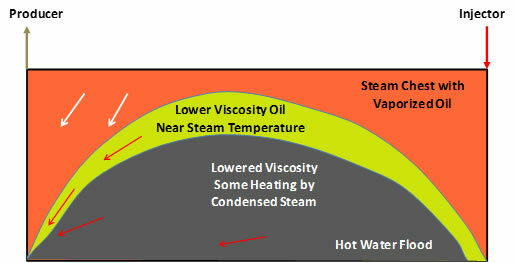 This again emphasizes the range of temperatures, pressures and depths where steam is generally used.